I hesitate to write a top 10 list as many perceive these as click bait. Hopefully, those that follow me, will know me better than that. At any rate, here are the main mistakes I see wildlife photographers making. Many photographers, and particularly new photographers, have a difficult time composing portraits of animals. What I most often see from new folks, is a portrait that only takes up less than 1/4 of the image area. Now, this might be a valid approach for an experienced photographer looking to create an environmental portrait of the subject, but for beginners I recommend getting closer. This can be achieved two ways. First, if possible, get physically closer to your subject. This might involve using a blind or using a stealthy approach. Secondly, use bigger glass. If you can afford it, buy a zoom lens like the Sigma 150-600 C. Just remember that long lenses require a whole new set of worries. Start with medium telephotos such as the Tamron 70-300 SP VC or the Canon 70-200 f4L. Get in close and fill the frame! After mastering this, move on to creating more compelling compositions. The image below provides a level of detail and impact because the subject fills the frame. Just go out to Flickr, or your favorite social media platform and browse through the wildlife images. Many have been over-processed and over-sharpened. When they become over-sharpened, the image takes on strange artifacts and edges that don't look realistic. I believe the reason most people do this is because they are trying to compensate for a blurry photograph. If you have a blurry image, then you missed the shot. Go back and try again. There is no shame in this and most of the greats do this quite frequently until they get it right. OK, smarty pants, how fast is fast enough? Well, like many things in this world, it depends. For the sake of brevity, use as fast a speed as your lighting conditions will allow. For example, if you are shooting birds in flight, and you want the wings to be frozen, a shutter speed of at least 1/1600 should be used (as a rule). The faster the bird can beat his wings and fly, the faster the speed. Shooting swallows requires a speed of at least 1/4000 for best results. When shooting a static subject, perhaps a bird perched on a branch, I like to use the reciprocal rule. Using full frame cameras, you should be able to set your shutter speed at 1/500 to handhold a 500mm lens. However, when shooting an APS-C, you have to take into account the crop factor. When shooting a 500mm with my crop sensor camera, I like to be in the 1/1000th of a second range. Note that this also does not factor in using image stabilization. With image stabilization on my Sigma 150-600, I have shot handheld at 1/125th of a second at 600mm with a static subject. For beginners, I recommend keeping the shutter at 1/250th even with VC engaged. Don't forget, rules can be broken, but right now I am giving you hard fast rules that will get you pointed in the right direction. Don't send me a long list of "but, what about..." emails. I know all about the exceptions to the rules :) Using a high shutter speed has frozen the egret below in mid-flight. Animals have what is often called a "fight or flight" zone. What this means is that each animal, through conditioning and just plain innate behavior, has a mental circle drawn around itself that predators are not allowed to enter. In the human world, we might call this "personal space." When the photographer enters this zone, the animal is going to do one of two things. He is going to run or he is going to attack you, but only if he feels threatened. Too many photographers approach the animal too quickly and too aggressively and flush the subject. You must approach slowly, very slowly and without making noise. For birds, approach is best done from a prone position. Move forward a few feet, take a few shots, then move forward again. Repeat this process until you get the composition you would like without causing the animal discomfort. Obviously any technique depends on how conditioned an animal is to humans. In some cases, you can simply walk slowly up to your subject and begin taking photos. With any wild animal, I recommend using extreme care when on the approach. In some cases, you may actually be able to get the subject to come to you. This allows the animal to be in control and this makes for better behavior shots. The shot below was made by slowly approaching this skimmer over time. You are going to hear this from just about every advanced photographer on the net, but it bears repeating. There is simply no substitute for a good tripod (when you need one). This is especially true with wildlife photography. When you set a 8 pound rig on a flimsy tripod, you are asking for micro vibrations and maybe even tripod leg failure at some point. You paid thousands of dollars for your rig and you are going to set it on a 50 dollar tripod? Are you also a low information voter? For economy and strength, I recommend the Manfrotto brand. You will not be disappointed with Manfrotto. If you want to step up, I would go with the Induro brand. I can't tell you how many times someone asks me what lens I used to photograph a particular subject. Then, they will turn around and buy that lens and ask me why they have soft images. The camera and lens are tools that we use to get our job done. You can go to the hardware store and buy a Milwaukee saw, but that won't make you a great carpenter. Now, mind you, having good equipment does remove that aspect from the equation. You will never doubt the equipment, but that equipment will not in and of itself improve your game. Honestly, I recommend starting out with an older camera and a medium telephoto lens. Learn to master these tools along with proper technique and then move up to the big leagues. There is absolutely nothing wrong with this approach and if you find out you don't like wildlife photography, you are not out a ton of money. Technique, knowing your subject, and practice are the keys to taking all this to the next level, and there is no moment when you have mastered photography. It is always a learning experience. Many who are just getting started in wildlife photography have the idea that they have to travel to some exotic location to take great shots. Although traveling to places like Yellowstone and Antarctica will give you exposure to some great wildlife, you can make great images in your own backyard. Even in large cities, there are parks which hold squirrels and birds. If you can afford to travel to exotic locations then by all means do so, but don't let location keep you from creating photographs. Don't use location as an excuse! If all you have are pigeons and squirrels then become the best pigeon photographer in the world. Whatever you do, don't stop shooting. 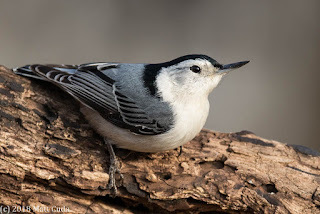 The nuthatch image below was taken in my backyard using my van as a blind. Do you know what shutter speed, ISO and aperture have in common? If you are dumbfounded by these basic elements of the exposure puzzle, then you will never make a great wildlife photographer. The reason for this is that light changes frequently and not only that, the reflection of light off our subjects further changes the equation. Not knowing the basics of exposure is a deal breaker! Get out there, read blogs, watch YouTube videos and practice! In the modern era there is a wealth of information on the internet. I had to get a degree with an emphasis in photojournalism back in the mid-90s to get a basic understanding, but in today's world, you don't have to, and so there is no excuse for ignorance. This is a principle which took me a long time to get and sometimes I think I still don't get it fully. Thankfully, understanding light in wildlife photography is a bit simpler than understanding how to be a great strobist like Joe Mcnally. First, as with most nature photography, there are two types of lighting that really make the difference. There is morning light and afternoon light. High noon is right out unless you are shooting on an overcast day. In the morning you want to shoot generally between sunrise and 9:30am. In the afternoon, you want to shoot about two to three hours before sunset all the way to sunset. During these times, the light is softer and because it is low to the horizon it produces a nice golden look. This is most often what you see in high quality photographs. There is one more important consideration. Generally, you want the light coming from behind you and lighting the front of the subject. This really makes the feathers of the bird pop and gives the animal a specular highlight in the eye. It can really make your subject come to life. 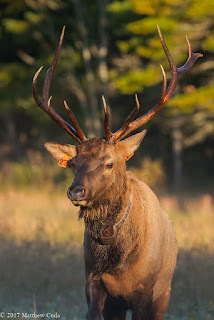 Beautiful morning light made this elk come to life. We have all heard the adage "practice makes perfect" and with good reason. As it turns out, practice does actually do us a great deal of good. Do you practice often? Wildlife photography practice can be done very easily. If you have a Walmart parking lot, then you have a good subject. They are called gulls and they make great subjects to keep your reflexes, exposure, auto-focus, and panning skills in tune. I recommend getting out about twice a month at a minimum to keep yourself from getting too rusty. Do you have a zoo? Zoos make a great, low pressure environment to both practice and create great images in the process. I go to my zoo about three times a year to check my gear and look for new techniques to improve my photography. 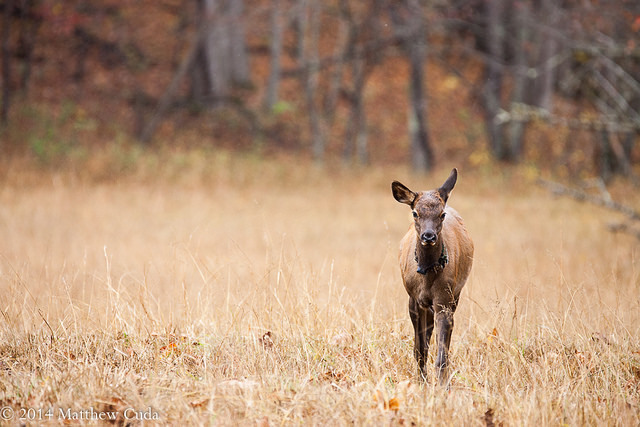 CATALOOCHEE, NC - Last weekend I took my second trip deep into the mountains of North Carolina to photograph the Cataloochee elk. On my last trip, in January, I was trying to capture frost and possibly snow, but on this trip, my main focus was the incredible opportunities offered by the rut. 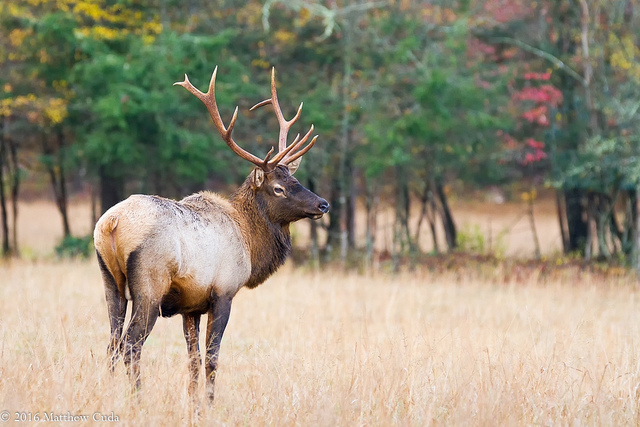 For those who do not know, the rut is the time of the year where the male (bull) elk is in search of cows with whom to mate. 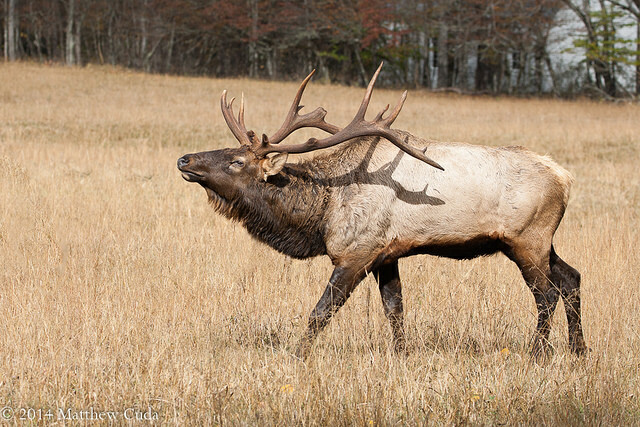 During this time, the bull elk is extremely high on his natural hormone, testosterone. His main goal is mating and defending this harem. Bulls will bugle to define their territory and fight head to head with rival males. After a long car ride of about 3 hours, I exited interstate 40, and began the 10 mile trip through the rugged mountain pass. This pass is 10 miles of dirt road that can barely fit two vehicles side by side. At several points during the drive, it actually narrows to one car traffic. It in the winter time it could be down right deadly. This is a not a trip for anyone with mountain and height phobias. 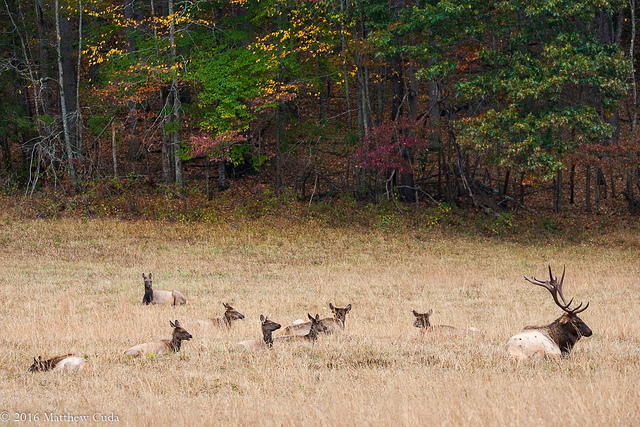 After about twenty minutes to a half hour, I entered Cataloochee Valley and began searching for signs of elk. The first several fields were empty except for a single young bull making his way to the other side of the valley. I pressed on until I located several other photographers parked along the dirt road (always a good sign) and from there I could view the main herd on a hillside. On this particular day, the temperature had dropped to 50 degrees, a wind was blowing out of the west ,and scatterings of cold rain fell throughout the day. Elk are not generally put off by such weather as they have thick coats to handle these conditions. The photographer on the other hand is a different story! Donning my long sleeved thermal shirt, jeans, waterproof shoes, windbreaker and my photography gear, I got out of my car to setup for the shoot. The elk were a long way off initially and simply too far for any great images. This is where you just sit back, relax and enjoy the beauty God has put before you. Some have even made the argument that it is times like these that make wildlife photography so enjoyable. Since I really didn't have a good angle on the subject at this point, I began to move around the far right side of the massive field before me. I found I could tuck myself in behind a tree line as to not spook the elk. Here I settled in and waited. It wasn't long before I was rewarded as a beautiful, young bull moving in from behind me into the open field. I never heard him coming and that is a good lesson for us all. Wildlife are so quiet that there is almost no sound as the move through the woods and fields. Always be aware of your surroundings and don't get tunnel vision. It might save your life. As the young bull moved out into the field, I noticed a nice fall background behind him and so I moved farther down the treeline to get a better angle. I waited, because I knew he would turn and check his six. As soon as he turned I fired off eight shots from my Canon 7D. As the young bull moved out of range, I took some opportunities to try and shoot the herd, but they were just too far off. I waited here a bit longer, but then moved back down the tree line, up the road and into a tree line opposite from the shot above. It is important to note that during the rut, it is not advisable nor legal to enter the fields which are occupied by the bulls. Failure to abide by these rules could result in fines, injury or death. You are no match for a large bull hopped up on testosterone. As the day wore on, I continued to follow the main herd and was rewarded with several interesting images. During a large rain, the entire herd bedded down in the middle of a field and I captured this environmental shot showing a portion of his 19 cows and calves. After the rain ended, the bull went around and rounded up the cows and they moved down to another area of the field to feed. During this time, I was able to get a couple very close images. At one point the bull was only about 20 feet from me. 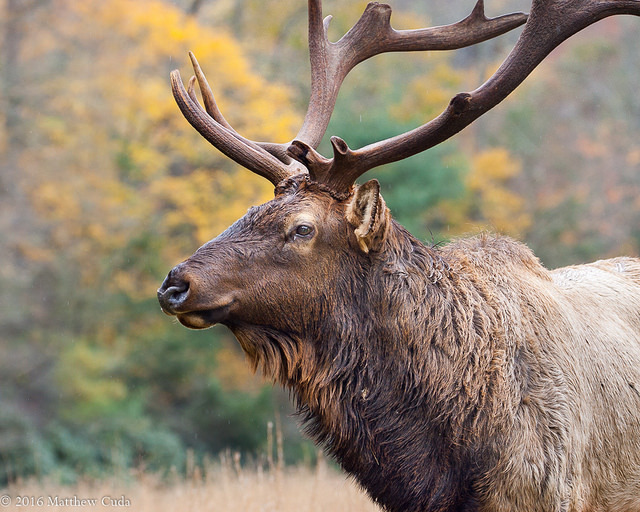 The rule is that you are not allowed to approach the elk, but they may do so at their choosing. If this happens back away slowly and make no aggressive movements. Image above erroneously stamped as 2014. It should be 2016. I have a few more images to post here, but I think you get the idea. I had, as always, a great time photographing these amazing animals. Just watching them is often reward enough, but taking images I can share with you, is really the reason I do this. I hope you enjoyed seeing them, and I hope I can continue providing them for many years to come. My camera is dead! My 1D Mark II, the old venerable camera which has helped me continue to provide images to you free of charge has given up the ghost. Buying my images, book and donating to the podcast helps to offset these huge costs and continue to provide you with quality training (often at no charge to you). Please consider donating to this effort. Thank you. First, let me say I almost hesitate to write this, but I can't ignore what I have witnessed during the last two years. I have always been a conservationist and then a photographer. I am a member of the National Audubon Society, but I am letting my membership lapse because of what I consider to be a ridiculous take on wildlife photographers getting too close to birds. I also know some great members of the Audubon and this is not directed toward them. Audubon is a very large organization which represents a cross section of bird enthusiasts. I think we can all agree that none of us want to harm birds or cause them unneeded stress. I am also going to offer real solutions to the problem later in this article. So if you can't handle reading something like this, skip down to the "So what is a rational solution" sub heading. I am seeing a disturbing trend by some to "villainize" wildlife photographers as people who will do anything for the shot. I have even heard the term paparazzi thrown around (totally insulting by the way). The very people who take the photographs Audubon and other organizations use on their websites are under fire. 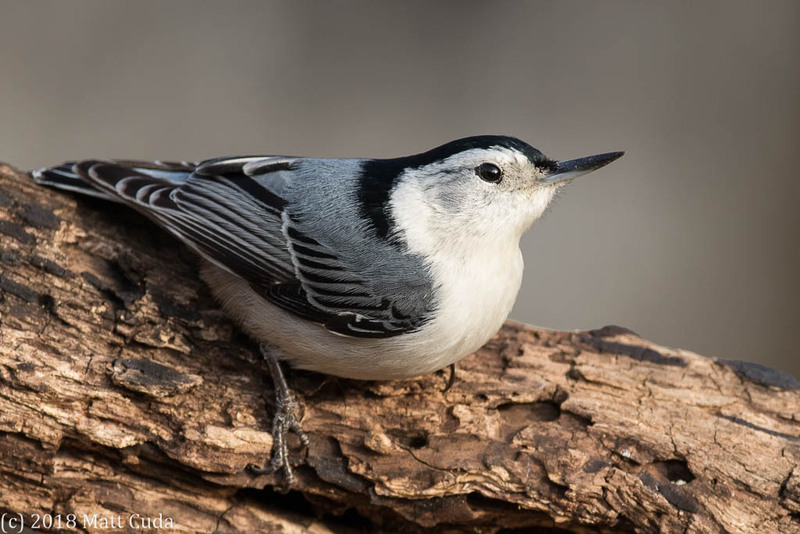 Some of these photographers helped save various bird species from extinction by their phenomenal photographs, and are often Audubon members themselves. In this article I examine, in depth, the problem we face as wildlife photographers, and the hypocrisy of those on the other side. I was listening to Artie Morris giving a presentation recently and he talked about how crazy the US government and political activist groups are getting when it comes to nesting and migratory birds. He referenced an article written by the National Audubon Society in 2015 entitled "Too Close for Comfort." Now Artie is a very outspoken photographer, but I think if you read between the lines, you will find that he is also an old, frustrated photographer. Like all of us, he is tired of getting "the stink eye" every time we put the camera to our eye. In this article, Rene Ebersole makes the case that photographers are getting too close to birds. This is complete and utter rubbish for the most part. All scientists have to do is study the birds nesting in locations like Gatorland and the St. Augustine Alligator Farm to see that humans will little impact on nesting birds. You see, at these locations, wild nesting birds flock by the hundreds to copulate and have their young and you know what? Humans are walking within feet of them the whole time. Guess what else? They have large lenses only feet from the nests. No negative impact is caused. Before we continue, yes there are those who break the law and cause stress to birds. To be fare to Rene, the article does state, "In the desire to get the perfect shot, some photographers push the limits, jeopardizing the wildlife they adore." Does that mean we rope off an area 300 feet away from the birds? No, of course not. First 300 feet is 100 yards. That is the distance of a football field and way beyond what is needed! You can't even observe birds well with a set of binoculars at that distance. Audubon themselves struggle with hypocrisy: Rene says, "Nature publications, including Audubon, wrestle with how to tell whether a photograph was taken ethically. “When something’s too perfect, that’s when I have to question it,” Audubon creative director Kevin Fisher said, offering an owl-in-flight example from this year’s Audubon photo contest. “Something seemed off. But a lot of times we just don’t know. We have to trust our contributors. And we are going to make mistakes.” In other words, we just don't ask any more questions because we need the killer images for our pubs. 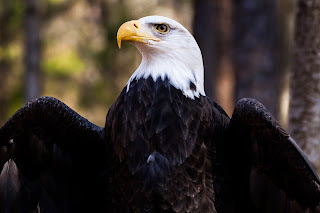 Perhaps the greatest hypocrisy is our own federal government who make it widely known that photographers should come and photograph the birds and other wildlife. Go to any NPS site and you will find a section encouraging photographers to come and photograph the birds. Yet when the photographer arrives, the entire area is roped off. Check out Pocosin Lakes Wildlife Refuge as their own brochures contain images taken in what looks like to me areas that are no longer accessible to photographers. So are they going to remove these images? Of course not. They make tons of money off people coming to visit the park. They live and die by reporting the number of visitors to these park locations. And yet after all this, they allow hunting on these preserves. Are you kidding? 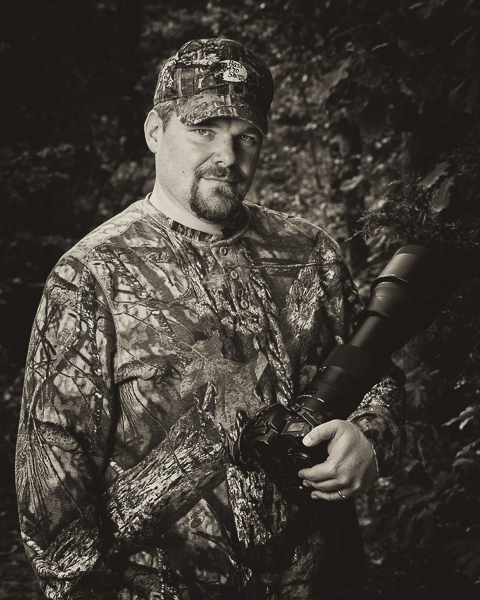 Photographers are killing birds, but hunters are not? Note that I am not opposed to hunting, but does this add up? The other interesting problem I see is giving a non-government group such as the Audubon the ability to police publicly owned land. Folks, we own that land, not some private organization. Imagine if the NRA was given charge of our nation's armories. Essentially, members of the Audubon end up being wildlife police. Let the conservation officers handle that. Note I am not talking about Audubon cleanup projects, banding projects and so forth. I am talking about those who feel they must be the police. You know the people I am talking about. First, I want the animals to be safe and protected, but I am not convinced that those who are in charge are doing this in a way that is fair to a free people. Not only that, but the hypocrisy that I see is absolutely stunning. We want your photos, but we don't want you to get close to the wildlife. This makes me laugh out loud to even think about this. Even with my Sigma 150-600mm on a APS-C body, I am only able to achieve 960 mm of effective focal length. This would give me a frame filling shot of a Great Egret at about 30 yards away. Any frame filling image you see was taking at under 40 yards away. Period, end of story! The problem folks, is that every situation is different. I have seen people just walking down a boardwalk flush birds. They were calm and doing nothing wrong but walking. I have also seen herons flush at 40 yards away and other herons walk right up to you to say hi. Biologists and other Audubon members regularly flush birds when checking nests for "scientific" reasons. As a member of Cornell's Nest Watch, I check my nest boxes once a day to count the eggs and the chicks. During this time, the female will flush from the nest, but she comes right back and I have two bluebird broods a year to prove it. So what is a rational solution to the problem. Special Permits - We used to create special permits to go into protected areas, but now we have taken to putting up fences at 300 yards away. Lotteries - I am not a huge fan of this option because of the wait list, but it can be effective during certain times of the year (like breeding season). Essentially when your name comes up, you can pick a date, get your permit and photograph. We do this with hunting and some bird preserves. This would keep large groups of people from showing up. Wildlife Drives - Another approach that works equally well are wildlife drives such as Blackpoint in Florida and Cades Cove in Tennessee. Using these drives (loops) photographers can remain on the road and the birds are never pressured. NPS Certified Guides - After going through a training session, guides will know the laws and will be held to a higher account. If they break the laws, stiffer penalties are applied. Only a certain amount of guides are allowed per year by lottery. Note, I am only talking about high traffic areas here and not the entire nation. Photographer Friendly Areas - Fish and game organizations are making headway in this area. For example, there is a blind located in Pungo Unit at Pocosin Refuge in North Carolina. I find, in general, that often they are located in unfavorable areas, and there are simply not enough of them. These could easily be constructed and paid for by special permits to the area. Note that I never said in this article that all photographers are innocent. Just like fishermen who fish at a lake with a no fishing sign posted, we will have photographers who are trying to get away with breaking the law. There are hunters who poach, but there are thousands who are law abiding hunters. I don't like to hunt and kill things, but it is their right, under the law to do so with a permit. It's up to conservation officers and other law enforcement officials to enforce and police the areas. I do think that what we are doing to each other is a crying shame and is not an effective approach. Giving non-government organizations the power to be watch dogs is really unsettling and only feeds individual egos. Giving photographers the right to trample down nesting birds isn't right either. We have to get to a place where this will work for both parties. Simply erecting fences and thumbing your nose is not a fair and equitable approach. Punishing the majority for what a minority is doing is wrong, but yet we continue. My advice to photographers is to write congress and join as many wildlife photography organizations as you can to help combat the problem. I am not going to tell you to not join the Audubon, but I do think you should let them know your thoughts in a calm and rational way. I think working together we can find a solution that is fair without calling in our lawyers and acting like children.